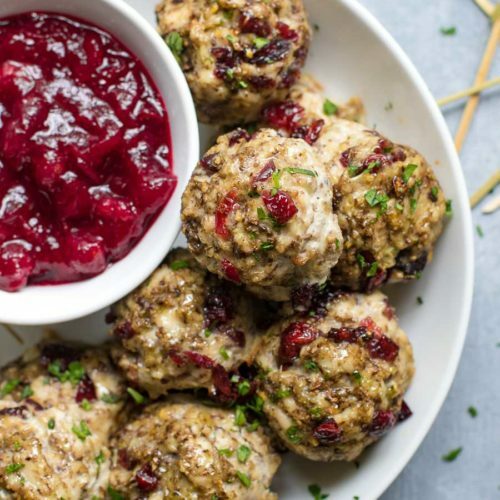 These Blenditarian Turkey and Stuffing Meatballs are Thanksgiving in a bite! Add them to your Friendsgiving menu or serve as a holiday party appetizer! Preheat oven to 375ºF. Line a sheet pan with parchment paper or brush or spray with oil. Using a meatball scoop or melon baller, scoop the mixture to form 24 - 1½ inch meatballs. The meatballs should be very moist but hold the shape when placed on the sheet pan. Place 1 inch apart on the pan. Bake uncovered 18-22 minutes until the center of the meatballs reaches 165ºF on a meat thermometer. Serve warm as is with mini skewers or with cranberry sauce for dipping. I added a sprinkle of parsley for extra color!